I had been to Pilsen many times. After all, it was only an hour away via the comfortable Student Agency bus service. I had even spent several days in the town, staying in a pension above a beer hall-restaurant, but I did not do much sightseeing. I had been in town for a theatre festival and found myself in various theatres the entire time. Indeed, I was ashamed that did not really know Pilsen well after having lived in Prague for more than 20 years. It had always been one of those places where I changed trains. I would soon find out that Pilsen certainly is worth visiting. It was even selected the European Capital of Culture for 2015. 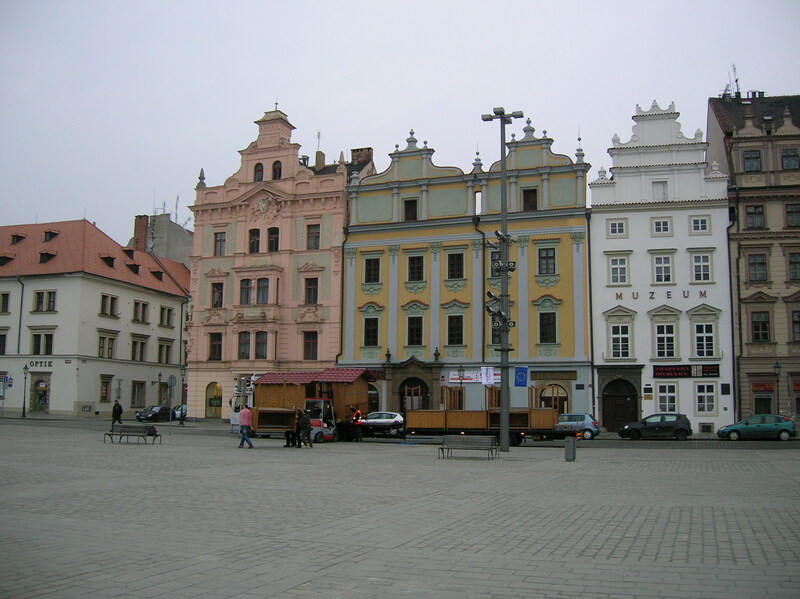 With a population of more than 170,000 inhabitants, Pilsen is the fourth biggest city in the Czech Republic. 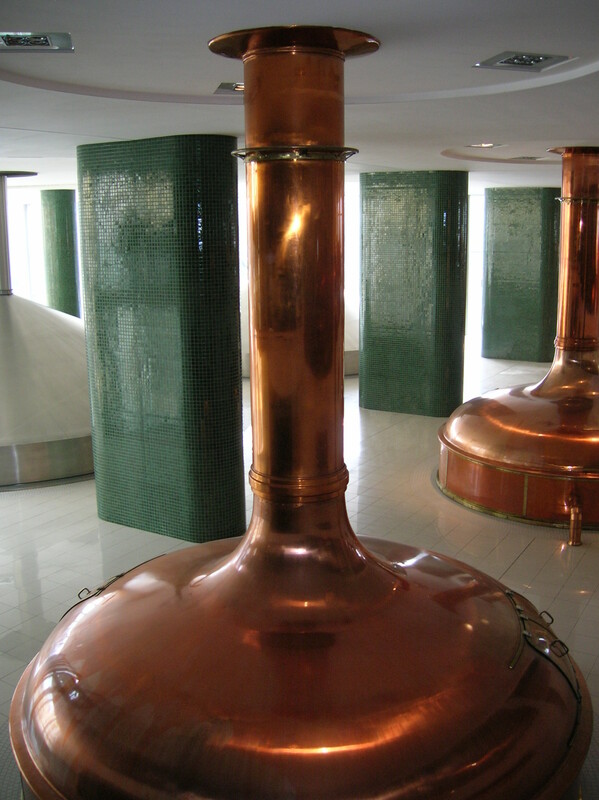 A travel blogger on Twitter mentioned that he had really enjoyed the tour of the Pilsner Urquell brewery. Although I rarely drink alcohol, I thought it would be intriguing to see how beer had become an integral part of the town’s history. I wondered what processes were entailed in brewing it. Before my tour of the brewery, I made a stop at the Museum of West Bohemia, where I visited an exhibition on the city’s history from medieval times to the 19th century. First, I explored other areas of interest in the museum. The Gothic armor in the armory was impressive, and the Meissen collection certainly caught my attention. I was especially drawn to a bowl with the entire surface covered in three-dimensional, handmade flowers with leaves. The handle looked like a tree branch. Dating from 1739, it was truly exquisite. Then it was time to concentrate on the history of the town in context with the events that had so greatly affected this land. The exhibition also focused on everyday life from the various centuries. There was an exposition of a medieval, rural house, for instance and recipes from the 15th and 16th centuries as well as a section on food and textiles in the Middle Ages. This is what I learned: Pilsen was established in 1295 by King Wenceslas II. 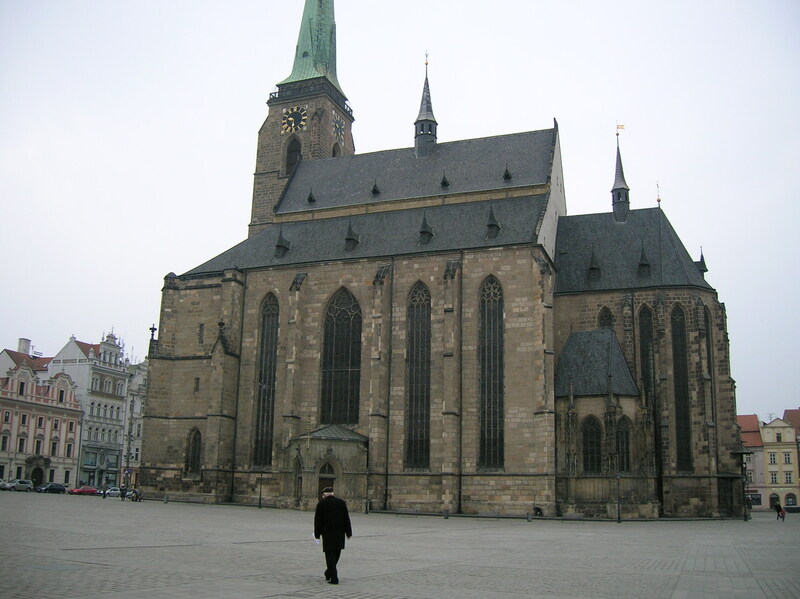 It was designed in a regular Gothic ground plan with a rectangular square that was 193 meters x 139 meters. In the beginning about 3,000 people lived in 290 houses. 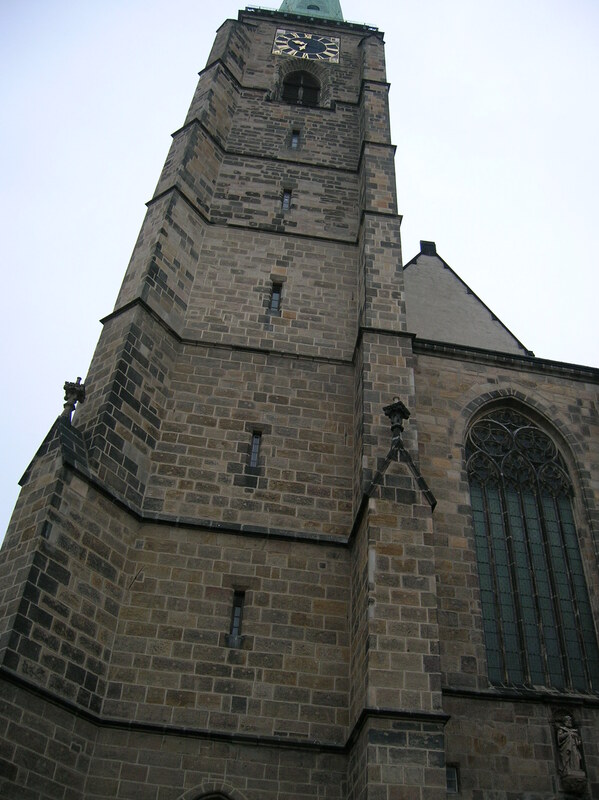 The town was significant because it was situated on a trade route from the German borders to Prague. When the Hussite wars ravaged the lands during the 15th century, the town at first supported the revolutionaries but then turned toward the Catholics in 1420. Pilsen was never conquered. During the second half of the 15th century, Pilsen became a regional center. It had a Catholic majority, most of whom spoke Czech. Because the town was located on an important route to Germany, there was much trading with Germans. Non-Catholics wanted to teach Pilsen a lesson for taking such a strong Catholic stance, so they set fires deliberately and destroyed part of the town. This happened, for example, in 1507. During the 16th century, because the city had a Catholic majority, it supported the monarch. 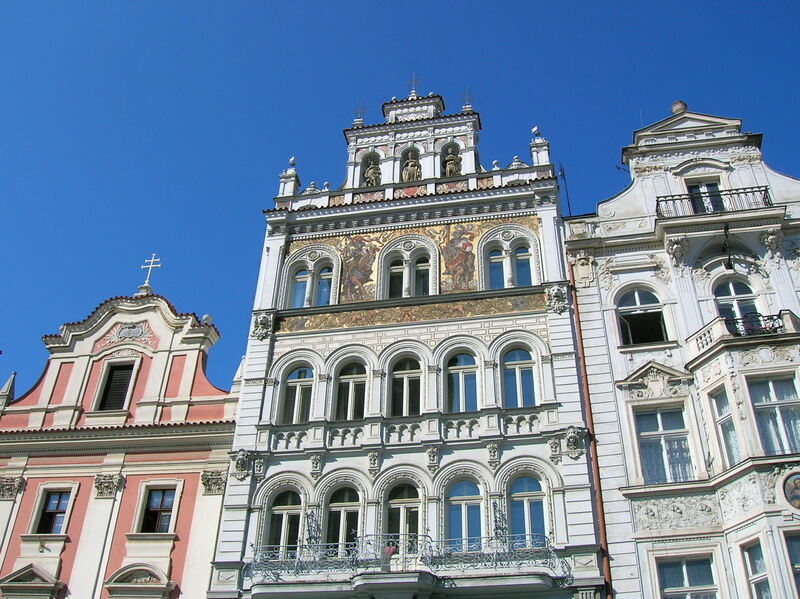 In the mid-16th century Pilsen ranked third among the biggest cities in Bohemia. The town flourished by buying villages and creating ponds. The beer brewing industry also proved successful – but more about that later. 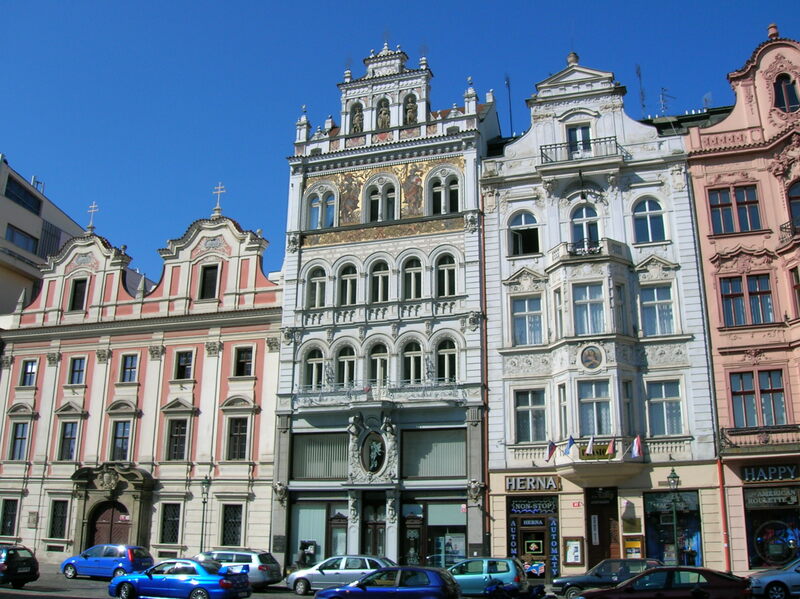 By 1557 Pilsen was ranked as the second wealthiest town after Prague. The inhabitants were mostly from Bohemia. At the end of the 16th century, Emperor Rudolf II took refuge in Pilsen when the plague epidemic spread through Prague. During the 17th century Thirty Years’ War, Pilsen, not surprisingly, supported the Catholics, who were victorious, so the town was not punished after the war. However, the 17th and 18th centuries were not all that rosy. In 1623 a fire destroyed parts of the town. The plague made its way to Pilsen in the 17th and early 18th centuries. There was another fire in 1729. Pilsen soon found itself as a provincial town. The population decreased, and the city experienced financial problems. In the middle of the 18th century, many immigrants came to the town. Some of the newcomers were officers for the administration of the city. At the beginning of the 19th century, Pilsen contributed to the National Revival, a movement to revive the Czech language, improve Czech culture and emphasize Czech national identity. Pilsen was one of many places where this revival was successful. 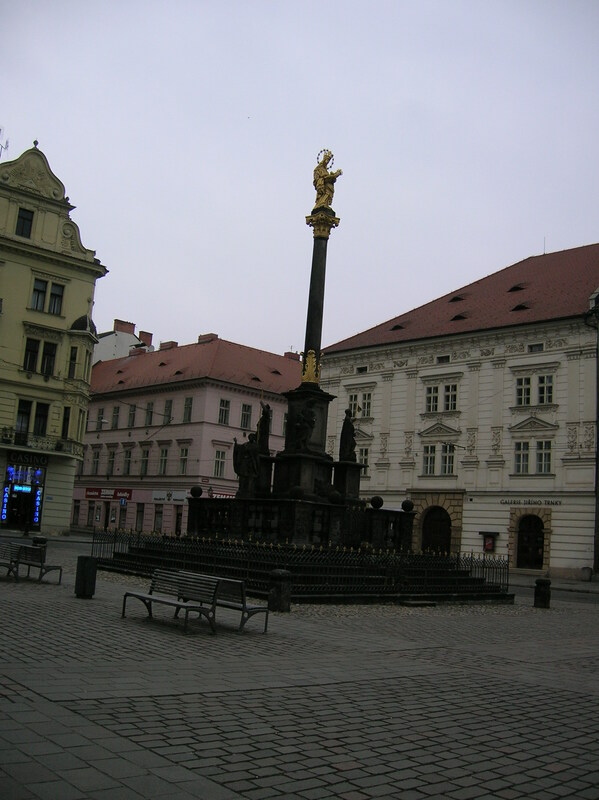 Czech schools were established. Theatres put on performances in Czech. There were Czech technical organizations, and Pilseners contributed to Czech literature. Yet there were hardships, too. In the 1830s, ethnic controversies riddled the town. Poor harvests and financial crises did not help matters. In 1848 Pilseners were among the Czechs who demanded national democratic and constitutional rights in the monarchy. At the end of the 18th century and at the beginning of the 19th century, Pilsen was a town oriented in trade and agriculture and had promise in the industrial sphere as well. The food industry grew thanks to breweries, mills and distilleries. The 19th century brought major developments in the city. 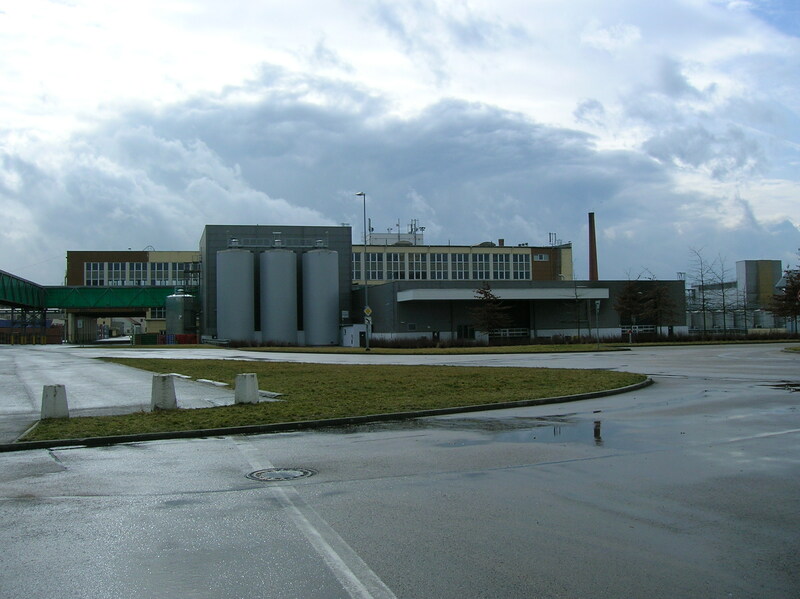 For instance, Škoda Works was established by Emil Skoda and became the top arms producer in the Austro-Hungarian Empire. Later the company became a leading engineering enterprise. The brewery brewed its first batch of beer on October 5, 1842. The Pilsner Urquell brand and the pilsner type of beer would capture worldwide attention. But more about that later. One feature I really liked in the history section of the museum was the focus on individuals who had made a difference during these centuries – people who were not necessarily famous. I learned about Joseph Vojtěch Sedláček, for example. 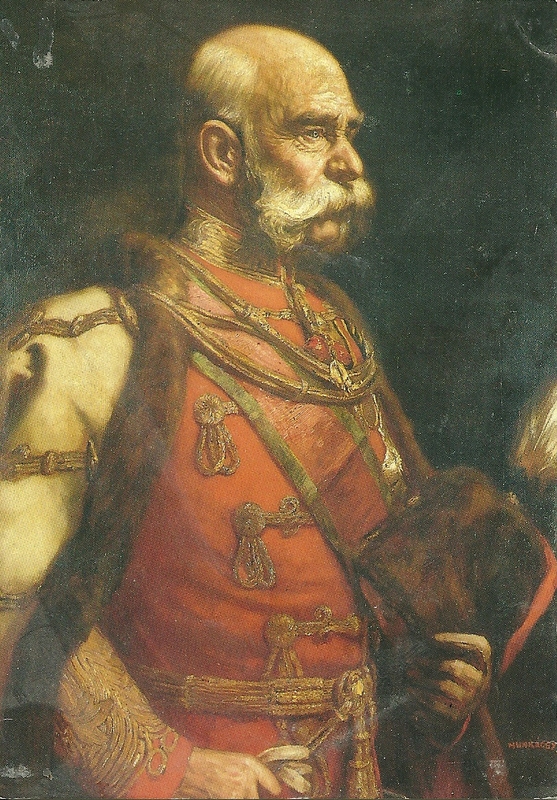 Active during the National Revival, he collected art-related objects for Prague’s National Museum. While he taught math and physics at a monastery, he also scribed poetry. He is also the author of the first Czech textbooks on math, geometry and physics. Now it’s time to get to the main topic: beer. If there is one thing that symbolizes the city, it is beer. The beverage was first brewed there at the time of the founding of the city in 1295. King Wenceslas II gave 260 townspeople the right to brew beer in their homes. The quality of beer was controlled by town councilors in the entrance of the town hall. The town magistrate poured beer on oak benches. Then councilors would sit on the benches for an hour. If their leather britches did not stick to the bench when they stood up, the beer was deemed undrinkable. In 1838, 36 barrels of undrinkable beer were spilled out in front of the town hall, an event which compelled some brewers to set up a brewery. The Burghers’ Brewery opened on October 5, 1842, when the very light, bottom-fermented Pilsner Urquell came into existence. Pilseners have the then 29-year old Bavarian brewer Josef Groll to thank for their internationally-acclaimed beer. He’s the one who put local ingredients of soft Bohemian water, very pale malt and Saaz hops into the mixture using a new method to produce bottom-fermented beer and then came across the new type of beer – the pilsner type — by accident on October 5, 1842. Two of the Czech Republic’s most famous brands of beer, Pilsner Urquell and Gambrinus, are made at the vast complex near the center of town in buildings that had been constructed on a former executioners’ site. I picked up my ticket in the Visitors’ Center, where an original wort barrel is displayed. The place was crowded with tour groups. 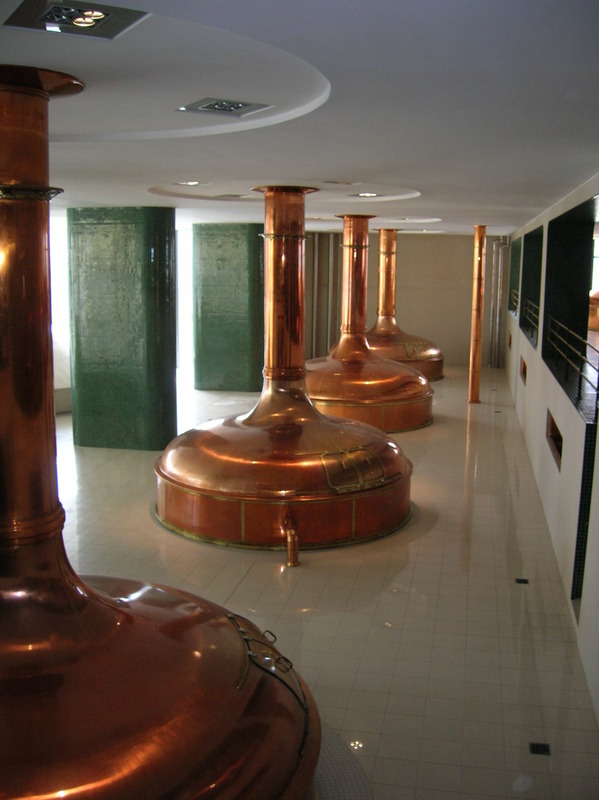 It was not possible to tour the Gambrinus brewery. For some reason there were no tours in March. When it was time for my English-speaking tour to start, we stepped outside, and the guide pointed out a few landmarks. The water tour hailed from 1907 and was 47.2 meters high. It reminded me of a lighthouse that I remember seeing as a child while on vacation near Freeport, Maine. As a young child I had wondered if some evil person had inhabited that lighthouse. The Pilsen water tour is no longer used. There was also a decorated historical gate built on the 50th anniversary of the brewery, in 1892. By the way, that year 462,550 hectoliters of beer were brewed there, and the brewery had more than 600 employees. The cellars even already had electrical lighting. The gate brought to mind the historical gate at the entrance to the town of Mělník, where I had visited a chateau a week earlier. The guide elaborated on the history of the brewery, mentioning Josef Groll and the 1838 barrel-spilling event, for example. 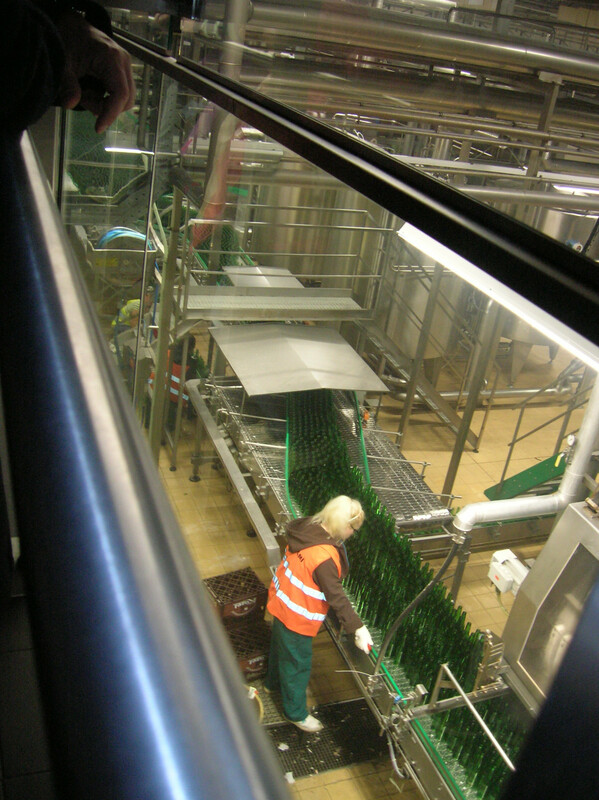 Then we got on a shuttle bus and went to the packaging hall, where we would see the bottle lines in action. The packaging hall was modern, hailing from 2006. There were four lines, one reserved for cans. On the premises was a washing machine as well as a camera that takes a picture of each bottle to show if it is clean. 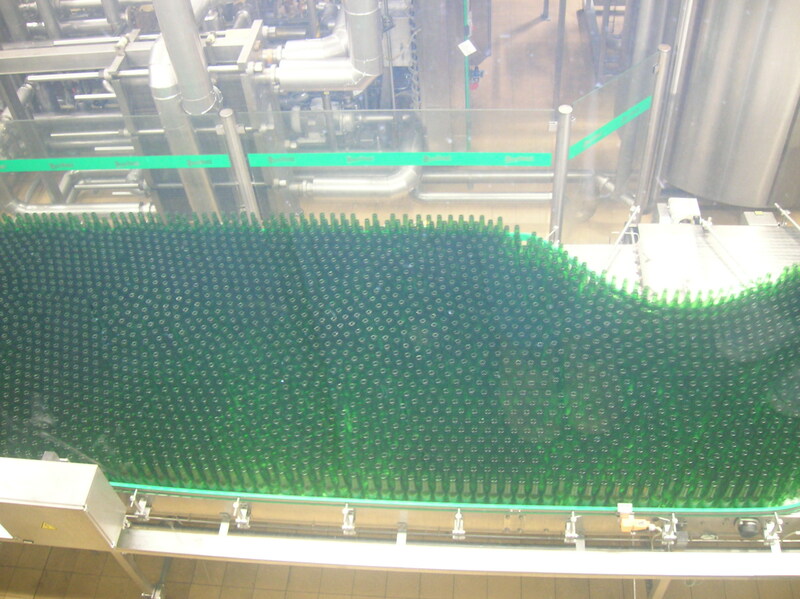 The bottles were filled, warmed at 25 degrees Celsius, dried and then labelled. We saw the huge bottle lines from above, behind glass. At that time two lines were working. Everything was so mechanical, so efficient. And to think that I only saw several people in the room while all this action was taking place! I almost expected to see Charlie Chaplin running from one side to the other as in Modern Times. It also made me think of Karel Čapek’s science fiction play R.U.R (Rossum’s Universal Robots) in which robots made by man take over the world, bringing about the extinction of the human race. Everything was so mechanical. It was as if an army of bottles were marching into battle. The process also reminded me of one of my favorite episodes of I Love Lucy, when Lucy and Ethel are stuffing chocolates into their mouths, picking them off the conveyor belt at the chocolate plant. That scene had such a human quality to it, though. I missed seeing many people in the hall. I tried to imagine it back in the days when people had worked at the belts. It both impressed me and saddened me that technology was so advanced. Then we took the bus to another location and saw some cylindrical tanks outside. 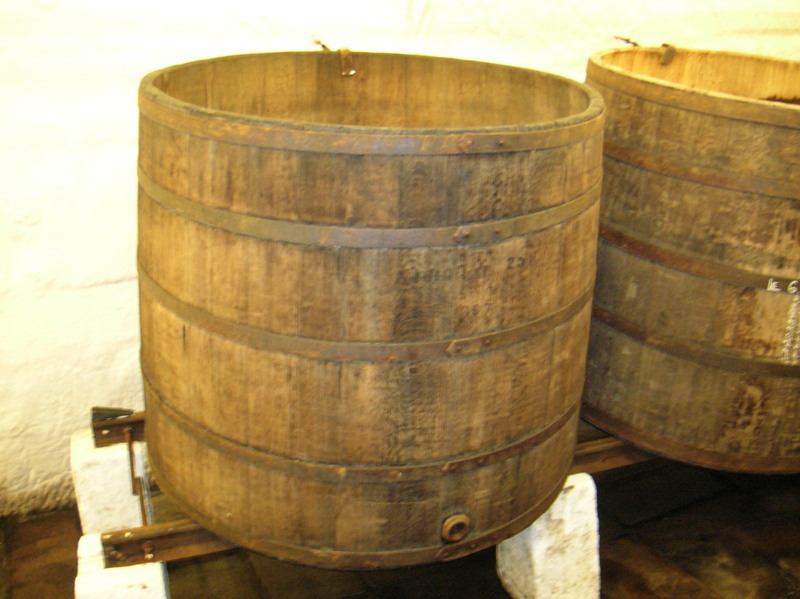 They were used for the fermentation and saturation of the beer. The guide mentioned that there were 20 cylindrical tanks outside and 110 in the building. A green-and-white train from 1952 stood to my right. At one time it had been used to take beer to the brewery. We went inside and got onto the largest passenger elevator in the country with room for 72 passengers. We watched a short film about beer production in a panorama cinema with a revolving floor. One of the things I learned from the film is that it takes about five weeks to make the beer. Then we went to an exposition on barley and the stages of malt production. You could hold the barley in your hand and sniff it. You could also see how yeast looks through a microscope and taste hops that came out of a machine that looked similar to a soap dispenser. The Saaz hops had a subtle aroma. An exposition explained about granulating the hops. It told how they had to be dried, ground and boiled. Then we went to the old brewhouse in a 1930s era building and the new brewhouse above it, which has been used since 2004. The former brewhouse had been used for 75 years. During that time five million hectoliters of beer had been brewed there. The tanks used in the brewhouse looked like alien space ships and brought to mind the TV serial Mork and Mindy and the movie E.T. 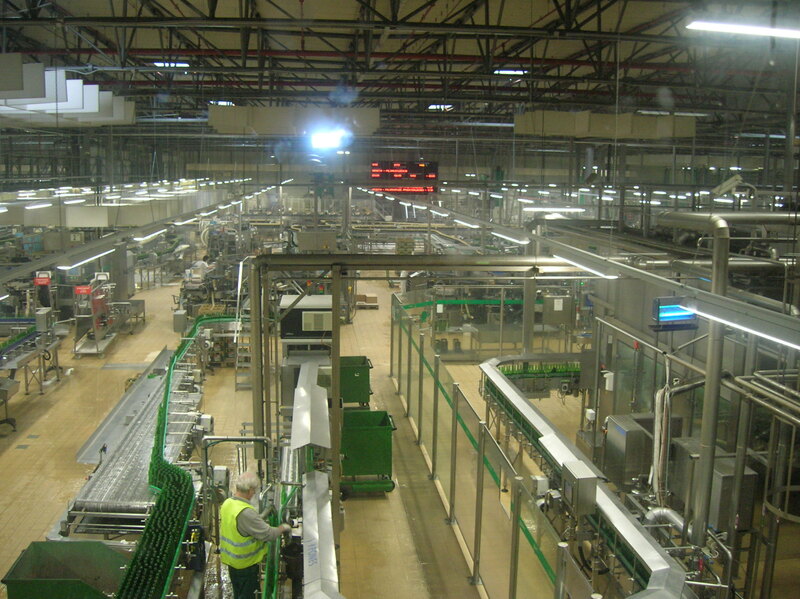 Two million hectares of beer are produced in the new brewhouse annually. The filtration process, for example, takes two hours, and the boiling process lasts 90 minutes. After that, the wort is chilled to six degrees Celsius. Only two people seated in a small office behind a glass wall controlled the mechanisms. Such a complicated process and only two people are needed to monitor it! Again I viewed technology as both awesome and disheartening. From there we went to the room called The Hall of Fame, where the brewery’s trophies and various awards are shown off. 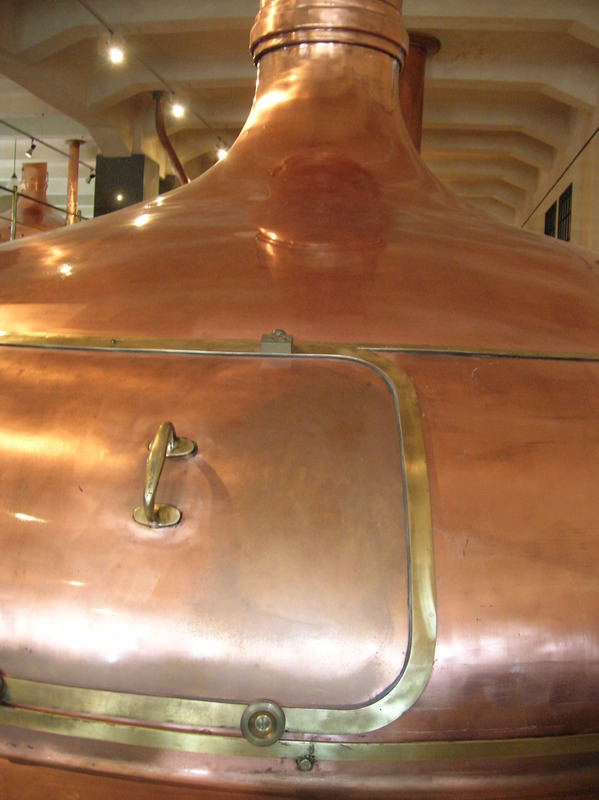 A copper bin on display once held the first batch of Pilsner Urquell. Habsburg Emperor Franz Joseph, who reigned from 1848 to 1916, had penned his name in the visitor’s book, but his handwriting was messy. The guide mused that the ruler of the Austro-Hungarian Empire might have been drunk when he signed it. I thought about the suicide of Franz Joseph’s son, Crown Prince Rudolf, and the assassination of his wife, Empress Elisabeth, nicknamed Sisi. To be sure, Franz had good reason to drink! Nineteenth century Czech poet Jan Neruda even wrote a feuilleton praising the brewery after his visit. It was published in Hlas on May 5, 1863. Emperor Franz Joseph signed the visitors’ book at the brewery. The guide also mentioned that the oldest house where beer had been brewed is at number 58, but I do not remember the street. Now the Beer Museum is located in that building. I had hoped to get there that day, too, but I would not have enough time. Then we explored the cellars. They were nine kilometers long, with a size of 32,000 square meters. Of course, we did not walk through every passage! I thought of how difficult it must have been to have built this vast underground area – it must have taken many people to make all these tunnels. No machines had been used to make the cellars. It had all been accomplished by hard, sweaty manual labor. I wondered who had done this sort of work. Poor people who needed the money? Prisoners? Maybe both. These underground spaces were once used for the fermentation and saturation processes. 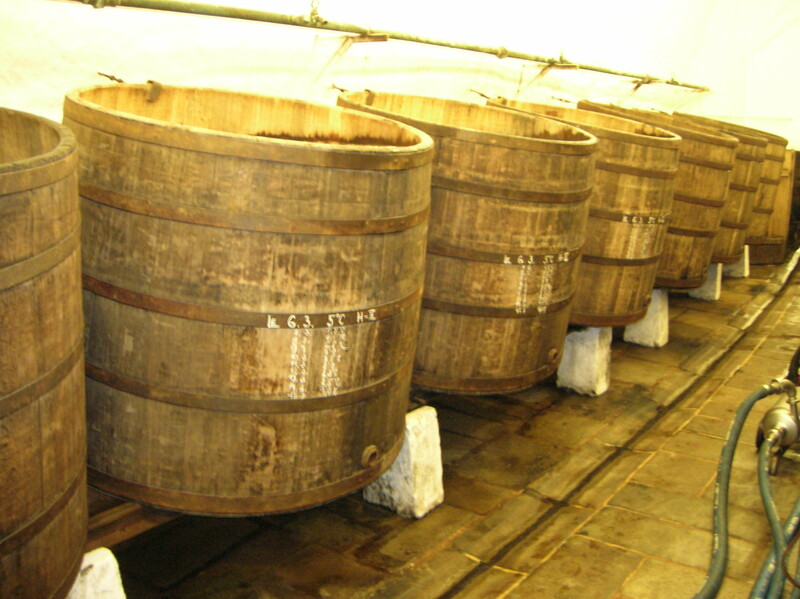 We saw storage areas with big, historic barrels. We walked through an ice room, too. In the second half of the 19th century, they used to cut ice from rivers and ponds to keep the place cold. At the end of the tour, we tasted unfiltered and non-pasteurized Pilsner Urquell beer. It was tapped straight from an oak lager barrel. The beer was very good, but since I am not much of a beer drinker, I am not enough of an expert to compare it with other brands. I tended to like black beer, but this light brew was as good if not better than any of the dark beers I had tasted. After the tour I went back to Republic Square in the center of town, where there are three modern gold fountains with black Chinese basins. I liked the gargoyles from which the water spewed. (I’ve always been a fan of gargoyles and the grotesque.) There was a 17th century Plague Column, too. For years I had wanted to go inside the Cathedral of Saint Bartholomew on the square, but it was never open when I was in town. It was only open certain months during weekdays. I had read that a Neo-Gothic altar featured the Madonna of Pilsen showing the Virgin Mary with a very expressive and sorrowful look on her face. 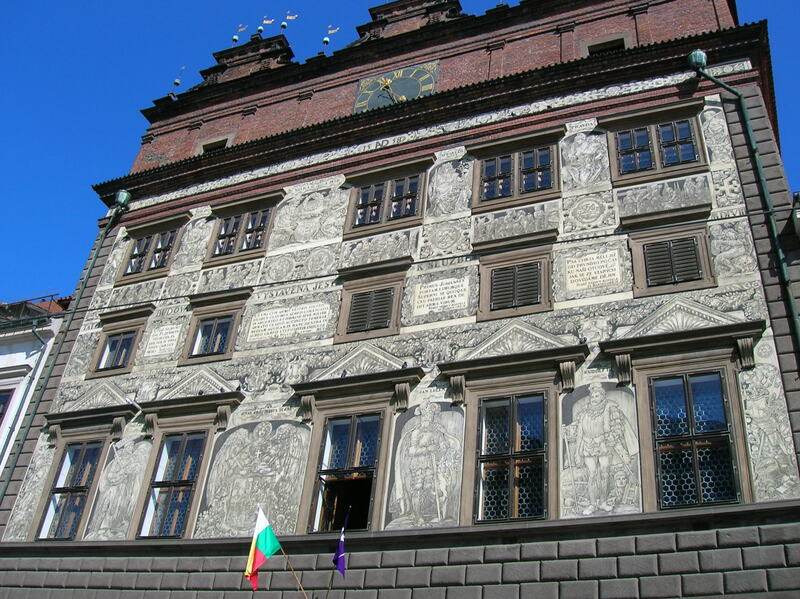 I loved gazing at the Renaissance town hall with all the sgraffito decoration on its façade that dates from 1558. I was very hungry, and I decided to eat lunch at my favorite eating establishment in Pilsen – the famous U Salzmannů restaurant around the corner from the square. During the 19th century this had been the most significant pub in the city. A famous event in Pilsen’s history was connected with this former beer hall. In April of 1843, the original owner of the place, Martin Salzmann, sent some beer to his close friend in Prague, a tailor named Jakub Pinkas. The tailor was so impressed with the taste that he decided to hang up the scissors and open a pub, U Pinkasů. The pub still serves Pilsner Urquell beer. Supposedly, Salzmann had been quite a character. He was known as a very grumpy and unpleasant man. He would place a coaster on the table for each customer and put the mug of beer on it. If he became disgruntled with a customer who was too drunk and too loud, he would take away the coaster and kick the guest out of the pub. There was another way to lose your coaster. If you clinked glasses – Salzmann hated it when customers did this – you also lost your right to drink in the establishment. Salzmann also disliked students and deterred them from visiting his pub because they often did not have enough money to pay for their drinks. After my late lunch, it was time to head back to the bus station. I vowed to come back to tour the underground areas of the city and to wander through the Beer Museum. I now am very aware that there were many sights to see in Pilsen, and I want to visit as many as possible.